NCCT Practice Tests are an ideal way to prepare for your upcoming National Center for Competency Testing Medical Assistant certification (NCCT-NCMA). The NCCT exam is intended to certify that a candidate has the knowledge, skills, and abilities to perform the duties of a Medial Assistant. The NCCT exam consists of 150 questions on various Medical Assistant job functions (e.g., patient care, medical office management, pharmacology and medical procedures). 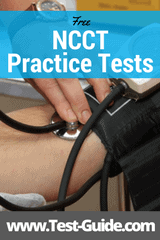 Our directory of free NCCT practice tests are listed below. Taking sample questions is an effective way to study for your Medical Assistant certification exam. Our free NCCT-NCMA sample tests provide you with an opportunity to assess how well you are prepared for the actual test, and then concentrate on the areas you need work on. Test-Guide.com's sample NCCT questions are an excellent way to study for your upcoming certification exam. Our sample tests require no registration (or payment!). The questions are categorized based on the NCCT test outline (see below) and are immediately scored at the end of the quiz. Once you are finished with the quiz, you will be presented with a score report which includes a complete rationale (explanation) for every question you got wrong. We will be adding more sample test questions in the near future, so please come back often. If you like these NCCT practice questions please make sure to like us on Facebook! Improving Your Speed - The NCCT-MA exam has an overall time limit of 3 hours. Although most students who take the NCCT feel that there is sufficient time, taking the practice tests with self-imposed timers help you budget your time effectively. You should budget approximately 1 minute for each question. Focusing Your Study - As you take more and more sample quizzes you begin to get a feel for the topics that you know well and the areas that you are weak on. Many students waste a lot of valuable study time by reviewing material that they are good at (often because it is easier or makes them feel better). The most effective way to study is to concentrate on the areas that you need help on. Understanding the Test Format - Every standardized test has its own unique format. As you take practice NCCT tests you will become comfortable with the format of the actual test. Once the test day arrives you will have no surprises! The NCCT certification exam consists of 150 questions that count towards your score and 15 unscored pretest questions. The majority of the questions will be multiple choice questions with four answer options. In addition, several questions will be “alternative” question types such as multiple-select, drag and drop or hotspot. Check reference resources to check medications. Administer medication by various methods (e.g., orally, inhalation, intradermally etc.). Identify common medications by both generic and brand names. Document medication administration, errors, prescriptions, and refills. Understand and follow CDC and OSHA standards and precautions. Perform general and surgical asepsis. Handle and dispose of chemicals and biohazardous wastes. Take patient history, obtain vital signs, and perform height, weight and BMT measurements. Assist the medical provider with patient exams, minor surgical procedures, wound care, and immobility/splint applications. Assist patients with oxygen therapy, spirometry, and nebulizer treatments. Perform first aid and basic life support procedures. Select and prepare the appropriate equipment. Perform bandaging and other aftercare procedures. Handle and process specimens appropriately. ECG placement techniques, recording, and interpretation (prepare and position the patient, capture recordings, prepare reports). ECG troubleshooting and maintenance (identify and correct errors and artifacts, check battery charge and paper, clean and store machine). Other diagnostic tests (point of care testing, urinalysis, paternity testing etc.). Communication (communicate effectively both orally and in writing, educate patients, manage informational materials). Medical Office Computer Applications (use medical software applications, maintain electronic medical data, and use peripheral devices). Scheduling (set up patient appointments, manage referrals, manage patient reminder systems). Medical Records (create, maintain, organize and protect medical records). Manage the opening and closing of the medical office. Maintain the office manuals for policies and procedures. Maintain files for medical providers’ professional status. Inform patients about practice financial policies and procedures. Collect payments owed by patient at time of service. Use appropriate codes to bill for services. Understand and comply with disclosure laws such as HIPAA and HITECH. Recognize legal responsibilities and unethical practices. Follow a Patient’s Bill of Rights (AHA). Route 1a: You are a current student of a NCCT authorized Medical Assistant program. Route 1b: You have graduated within the last 5 years from a NCCT authorized Medical Assistant program. Route 2: You have two or more years of full-time experience (verifiable) as a Medical Assistant within the last five years. Route 3: You have completed a Medical Assistant training program while serving in the U.S. Military within the last five years. The NCCT Medical Assistant exam is administered as either a computer-based test or a traditional paper-based exam. Candidates work with NCCT (by calling 800-875-4404) to determine test dates and test sites. Candidates must submit all application material at least 14 days before the requested test date. NCCT staff will process application materials and notify candidates via email or US mail in approximately three to five business days. If a candidate wants to change their test appointment they must do so at least 24 hours prior. Candidates may reschedule one-time without a fee. Additional rescheduling requests will cost $10. Refunds are only available to applicants who request to withdraw within three business days after receipt by the NCCT. The refund will be for the entire examination fee minus a $25 processing fee. $90 (for Route 1a current students or graduates within last 6 months, or Route 3: Military). $135 (for Route 2 experienced Medical Assistants, or Route 1 graduates after 6 months). The NCCT/NCMA exam is scored on a pass/fail basis. The passing score for the exam is based on a variety of factors including established difficulty ratings for each test question. If a candidate passes the exam they have demonstrated an acceptable level of knowledge regarding the skills and abilities required of a Medical Assistant. Receiving a higher score than the passing score is not an indicator of more advanced knowledge or a predictor of better job performance. Scoring is immediate for computer-based tests and may take two to four weeks for paper-based tests.